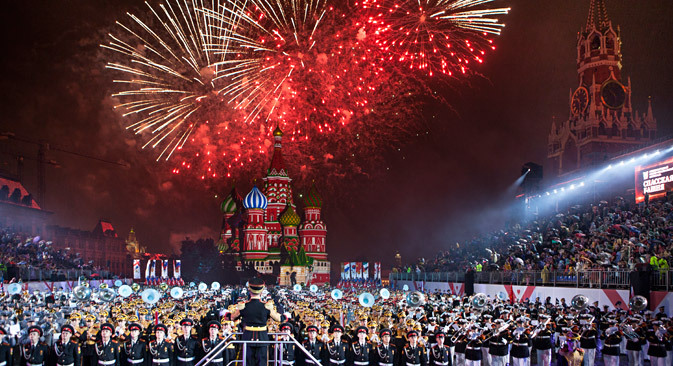 More than 1,500 musicians and artists from all over the world will participate in the Spasskaya Tower International Military Music Festival will on the Red Square. The program includes brass bands, dancing, acrobatic shows, martial arts, trick riding, and master classes for children. The Red Square will be unrecognizable over the course of the nine-day Spasskaya Tower Festival, one of the world’s largest military music festivals. The annual event has served as a gathering place for musicians from over 40 countries since 2009 and expects to attract 56,000 visitors this year. Performances will begin at 11:00 AM everyday starting today and last until late into the night. This time, the festival will feature musical groups from Italy, Greece, China, Bulgaria, Ireland, Switzerland, Kazakhstan, and Turkey. Popular French singer Mireille Mathieu will also perform. Also among the participants are a group of Taoist monks from China, who will perform Oriental martial arts, as well as the President's Band of the Moscow Kremlin Commandant's Service of the Federal Protective Service. The latter has played with the Scorpions and Ken Hensley from Uriah Heep, and has also recorded music for 40 feature films and sporting events, including the 1980 Olympic Games. “This year, the whole world is marking the 100-year anniversary of the First World War,” said Alexei Levykin, Director of the State Historical Museum. “The organizers selected the date as the symbol for the festival. On opening day, 500 historical reenactors will recreate the atmosphere of the war years,” he said. Head of the military orchestra, Major Konstantin Petrovich, let RIR in on a secret: servicemen from the 154th separate commandant regiment will put on a performance in historical military uniforms dating from 1914. In addition to musical and historical programs, the festival will feature trick riding by famous French acrobat rider Lorenzo, while the Kremlin Horse Riding School and Kremlin Regiment will arrange performances on horseback. A special arena is being created on Red Square to accommodate the trick riding, where children will also be able to learn how to ride ponies as part of the children’s portion of the festival, entitled Spasskaya Tower for Kids. There will even be a special children’s playground with fun interactive games. The Combined Orchestra of the Russian Interior Ministry Troops and the Sevastopol Military Orchestra of the Black Sea Fleet Staff will be performing for the first time at the festival this year. The country’s oldest military band – the Central Military Band of the Ministry of Defense, founded in 1927 – will stage a performance. Another newcomer is the A. V. Alexandrov Song and Dance Ensemble of the Russian Army. The Tenochtitlan Folk Dance Ensemble and Banda Monumental Orchestra are coming all the way from Mexico to perform. Ireland’s Le Cheile Sa Cheol Massed Pipes and Drums will also be performing, as will military brass bands from Greece, Bulgaria, and Switzerland. Another memorable event will be a performance by the Turkish Mehter Band, which has existed since the 13th century. These musicians, who play on authentic medieval instruments, feature a repertoire comprising mostly Ottoman military marches from various eras. Despite stereotypes that these types of music festivals are nothing but long concerts where the audience sits around all day listening to musicians, Spasskaya Tower is much more than that. Over the course of nine days, the events are staged for the purpose of giving visitors a choice of entertaining options. The program itself does not lend itself to boredom – there will be Oriental martial artists, military parades, concerts, stunning theatrical productions, weapons demonstrations, a children’s festival, exciting master classes, and much more. The festival schedule can be found here. You can buy tickets online here or at the ticket booths listed on the website.